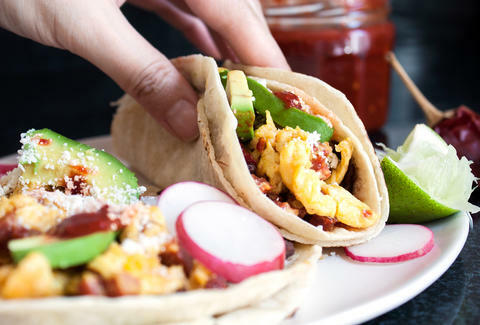 There is no better start to the day than one or three breakfast tacos -- a handheld breakfast brimming with spices and flavors that are guaranteed to snap you out of your sleepy AM state. Whether you’re chasing down a snazzy weekend brunch, looking for a weekday breakfast taco, or in need of some nighttime breakfast taco snacking, San Francisco’s got you covered in any neighborhood. Tacolicious brings its signature deliciousness to its weekend brunch menu, which includes a stellar taco option for breakfast taco fans. 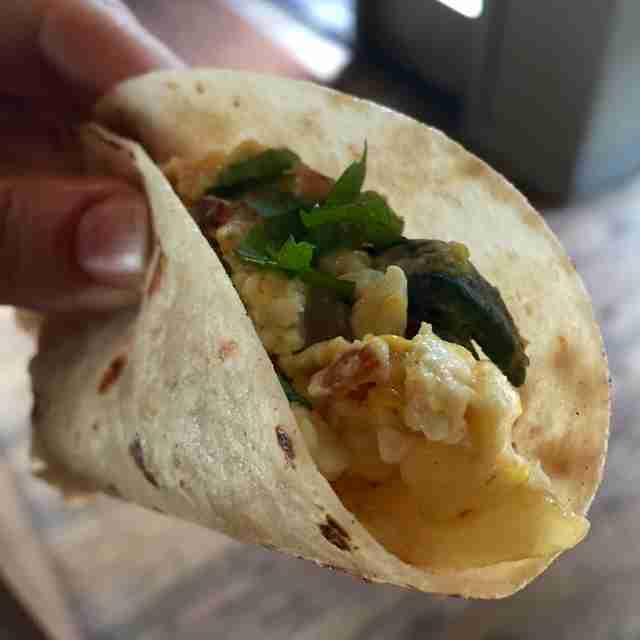 The Lone Star Taco combines smoky poblanos, a rich homemade salsa macha, and Oaxacan cheese with scrambled eggs, bacon, and potatoes. 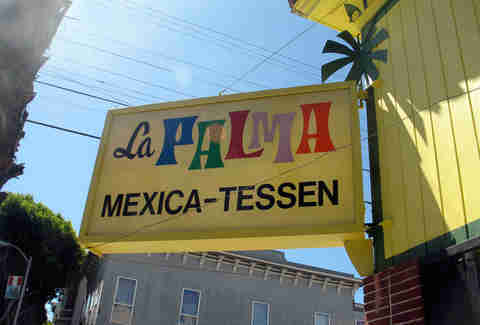 The results are tucked into a fresh, warm La Palma tortilla. Pair it with a Caffe Roma coffee, or one of the legendary spicy Tapatio-spiked micheladas. 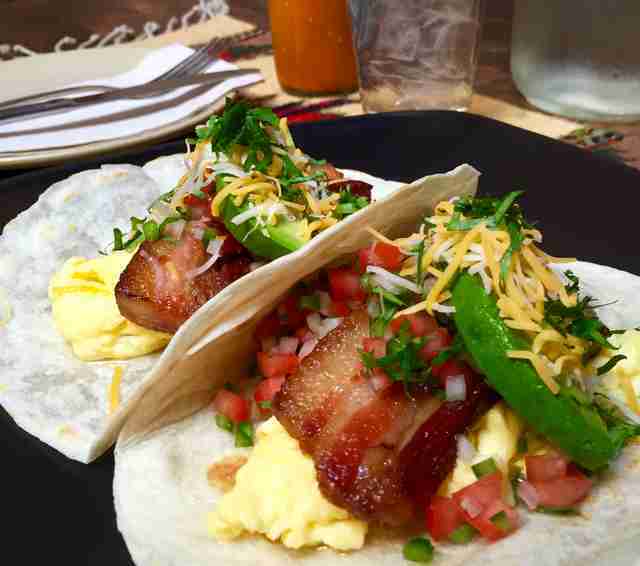 For those weekday hankerings, La Palma delivers breakfast taco perfection seven days a week. This Mission staple keeps it simple with a flavorful potato, egg, and chorizo filling folded into one of its homemade tortillas. All of La Palma’s salsas and tortillas are made fresh daily, in-house, and without preservatives -- which means you’re getting the absolute best ingredients in your taco. There’s only outdoor seating here, so plan to enjoy the sunshine (or brave the fog) as you demolish your breakfast. Go for the soft or crispy shelled versions of these unbelievable tacos; you won’t be disappointed either way. Green Chile Kitchen wraps scrambled eggs, spicy pico de gallo, and your choice of meat in homemade blue corn masa tortillas. Its soft or crispy breakfast tacos are available as part of the delicious weekend brunch menu on Saturdays and Sundays from 9am-2pm. Choose your own breakfast taco adventure as you select between scrambled tofu or a pile of marinated steak. Radish keeps its breakfast tacos pretty classic, topping your choice of protein with sauteed bell peppers & onions, salty white cheddar, and ripe avocado, all of which is piled into a warm corn tortilla. These are paired with hash browns, fruit, or salad so you can turn your taco feast into a proper breakfast. Snag these breakfast tacos Tuesday through Friday before 3 pm and, if you’re dining on a Saturday, order up some bottomless mimosas. Mouthwatering breakfast tacos? Check. Heated patio with plenty of outdoor seating? Check. An out-of-control array of fresh salsas and taco toppings? Check. The Little Chihuahua is the perfect place for a breakfast taco brunch. The breakfast tacos are an explosion of flavor, featuring sauteed poblano chiles, eggs, a smoky chile salsa, salty seasoned Mexican potatoes, and more. Go meaty with a spicy chorizo and Jack cheese filling, or enjoy a savory veggie combo of sauteed spinach and goat cheese. These breakfast goodies are only available on Saturdays and Sundays from 10am to 3pm. Pair them with a Sightglass coffee or a carafe of tropical passion fruit mimosas. There’s a reason that these beauties are the star of the West of Pecos brunch menu, holding down the fort as its most popular brunch dish since the Mission Tex-Mex outpost launched a brunch menu. It’s a decadent breakfast taco extravaganza. The Pork Belly Austin Taco combines succulent slices of maple-glazed pork belly with fresh avocado, shredded cheese, golden scrambled eggs, and a drizzle of spicy chipotle aioli. Pair these with the famous Monster Mary (a giant bacon-spiked Bloody Mary) and you’ve got a brunch fit for a king. You can devour these tacos on Saturdays and Sundays from 11am to 3pm. Monday blues? 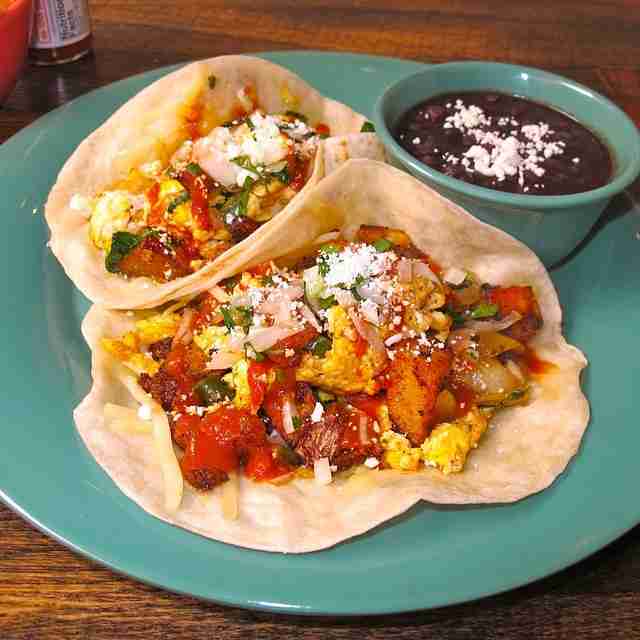 Start the day off right and grab a pair of traditional breakfast tacos any day of the week at Taqueria Dos Amigos. Every order comes with two tacos stuffed with scrambled eggs and potatoes that come to life with spicy chorizo and fresh salsa, all piled into a warm tortilla. Spicy, cheesy, and totally satisfying -- these breakfast tacos will wake you up and get you charged for the day. Every Saturday and Sunday, Colibri Mexican Bistro churns out some of the city’s finest breakfast tacos, packed with bold, bright flavors. Fluffy scrambled eggs, velvety black beans, and luscious nopales are guaranteed to satisfy. Crisp white onion, jalapeño, tomato, and cilantro add a splash of serious flavor. Sweeten the deal with bottomless mimosas (the ideal mate to any breakfast taco). 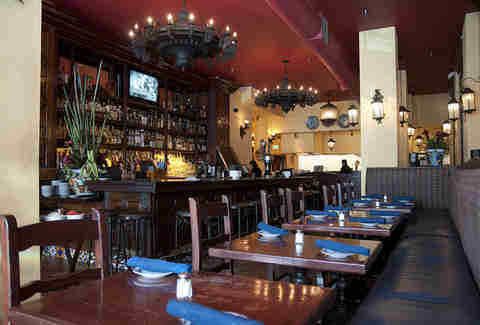 Matador is known for its legendary tacos. You’ve knocked back tortillas piled high with ingredients from here for lunch, dinner, and happy hour. 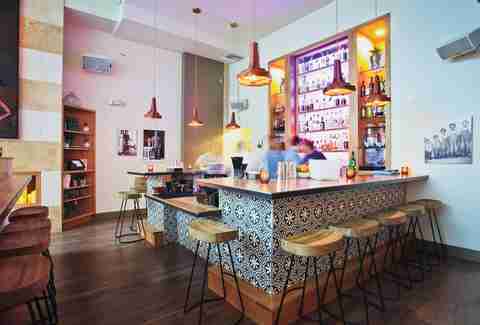 So why miss out on taco excellence at brunch? The Matador brunch menu includes mind-bending breakfast tacos stuffed with spicy house-made chorizo, eggs, salty queso fresco, and a drizzle of fresh pico de gallo. Customize the size of your order and start with just one taco, or spring for the three-taco plate for hungry weekend mornings. Claire Margine is a writer in San Francisco who is always chasing her next breakfast taco. Follow her on Twitter @cmoshenb or check out more of her work at ClaireMargine.com.